This challenge and book are dedicated to Mel Gill who passed away in April 2016.
and will be sadly missed in the freeform community. For our Freeform Guild the Annual Challenge is our 'Jewel in The Crown’. It is very special: what we get is a spontaneous outburst from people all over our international membership who want to share something of themselves – what they dream of, what they've worked on, worried over, struggled with and finally delivered - in order to make a piece of collaborative work larger than all of us. Each time the group discusses this we extend and embroider our existing definitions in the light of fresh observations, but always end: " … so really it's whatever you think it is … or want it to be." 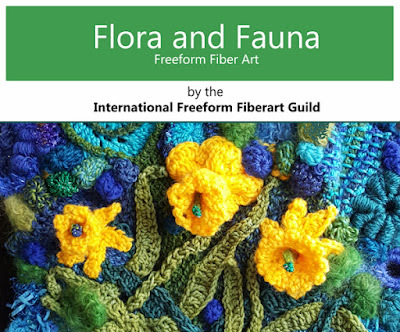 Above all 'freeform', especially in crochet and knitting, is an approach to fabric-making intended to free our minds from everything that has gone before, until we feel it's the right moment to look back into our traditional toolbox and to pick something out. It gives us a way to start making without necessarily knowing what we're making or having all the materials in front of us; and of letting the work develop and transform itself in our fingers. And yet equally it may be highly disciplined and carefully calculated or have planned/controlled elements, as did the fine lacework produced in Ireland in the 19th century. Following those finely spun and mainly monochrome days the urge to make fabric in a freely constructed manner in crochet and knitting seemed to go dormant. Then, from the mid-20th century, prompted by the burgeoning availability of highly coloured and textured yarns, creative people were no longer content to be treated solely as domestic automata nor to have their creative dreams shackled by the cultural norms of the previous hundred years and were motivated to set themselves free. Ever since then, turbo-assisted by the internet, there has been a continuous explosion of dazzling freeform creative work - all exemplified by our Challenge - that has become almost mainstream and a gloriously shared culture throughout the world. THANK YOU SO MUCHFOR THIS ADD WHICH LED TO MY KNOWING WHICH AREA OF FREEFORM ART I AM MOST COMFORTABLE IN AND ALSO HAVE FAITH INMYSELF THAT I WILL BE ABLE TO DO EVEN WITHOUT A TUTOR : THE FOLKLORE FREEFORM : I WILL BE FINISHING AN ITEM I STARED MANY YEARS AGO BUT HAD LEFT IT AS A CREWEL ITEM THOUGH I KNOW I WOULD PREFER TO FINISH BUT WAS AT A LOSS ON WHICH DIRECTION TO TAKE,NOW IKNOW WHAT I NEED T DO.